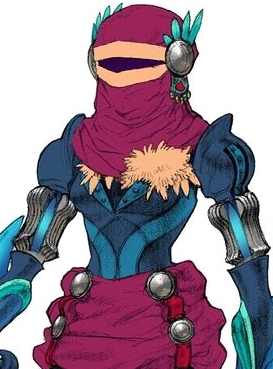 Guillo is an arcane puppet in Baten Kaitos Origins, with the souls of a sorcerer and sorceress bound to its body. Never addressed with any pronouns aside from “it”, Guillo speaks with masculine and feminine gendered voices simultaneously. In addition to its vocal style, Guillo interacts with others using a mixture of masculine, feminine, and non-human mannerisms. While Guillo seems to have on stiletto-like shoes and wears “feminine” body armor, Guillo is canonically agender (as it is a living doll). This entry was posted in 2000s, Agender, Gender non-conforming, Playable Character on May 25, 2016 by Adrienne Shaw.